Sunday morning was overcast, but the rain held off long enough for four of us to get some quality sketching time in. There wasn't much going on at this end of the movie set, but we can always find plenty to draw. We did hear one gunshot much further up East 9th, and we saw lots of workmen searching through the pile o' debris. They seemed to be looking for mangled street grates. Security guards came and went. One guard looked like he was sitting (or sleeping) in a recliner. Later in the morning, people started to show up for the Indians' game, and we were treated to a man across the street yelling, "Tickets!" for the better part of an hour. We stayed until we couldn't take the smell of french fries behind us at Panini's any longer. Instead of getting that, we went over to Li Wah and had dim sum. One of our favorite things to do on a Sunday! 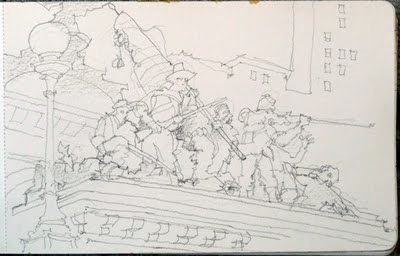 I'll post another sketchcrawl in a couple of weeks. We should have time for a few more before the weather gets cold. It usually stays nice and hot well into October. Who: Everyone is invited! All levels and skills are more than welcomed! NOTE: Please check this blog before you leave the house on Sunday, because any cancellation will be posted here by early Sunday morning. If there is no posting, then it is ON! It was terrible rain storm Sat. Mina and I found a little corner and hurried up did some sketches. what an experience. We treat ourselves Dim Sum afterward. 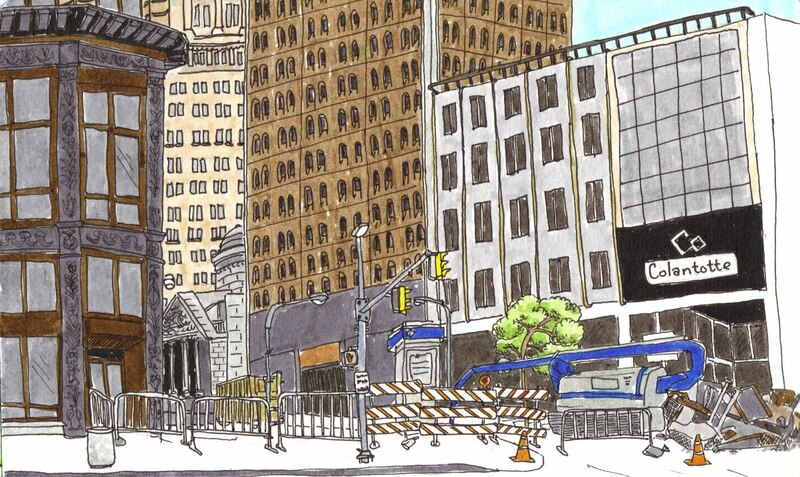 I went downtown yesterday (thinking the crawl was on a Saturday as usual), decided to skip the filming and just did a sketch of Euclid Ave looking west. It was hot sitting on that sidewalk! 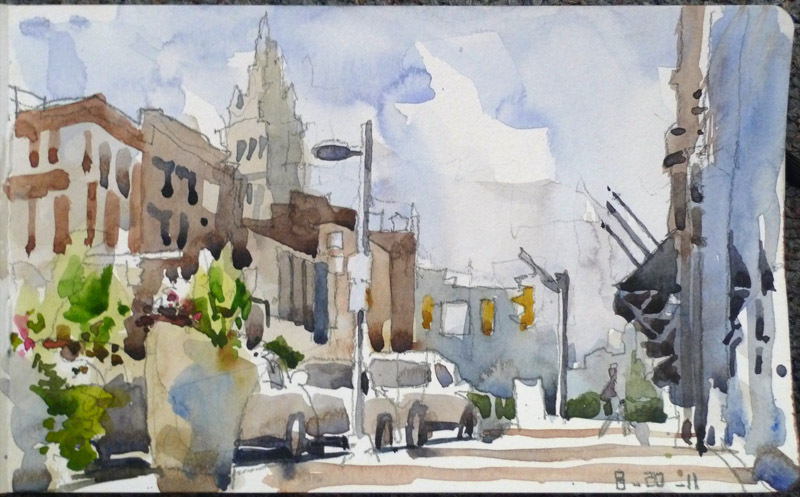 A guy came up and chatted with me a while about the watercolor process, saying that he dabbled in it at one time. I hope he gives it another shot! 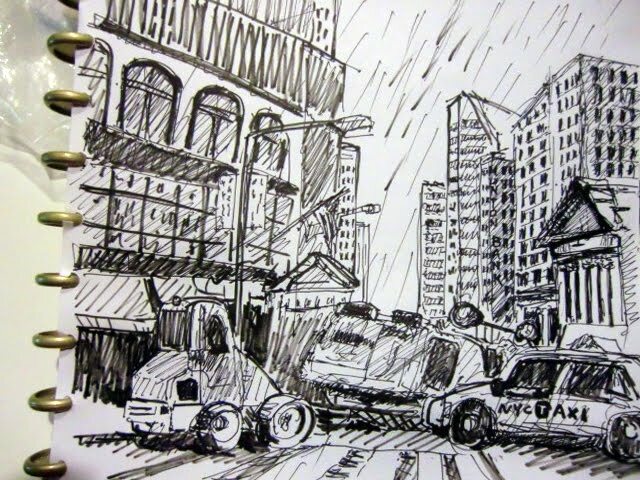 Today's sketchcrawl at the Avengers' movie set is postponed. I will post details about rescheduling it for next Sunday in the next few days. Please watch here tomorrow by 7am. I am watching weather forecasts, but I'm going to wait until tomorrow morning to announce if it's postponed or not. 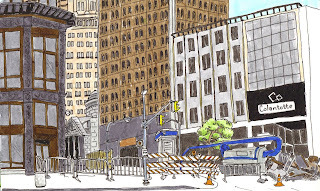 Please join us at a Sketchcrawl at the Avengers' movie set. We are going to meet at the Charter One Bank on Superior at East 12th (1215 Superior Ave, Cleveland, OH for your GPS/Mapquesting). There is a lot of street parking around there. Meet at 9am. If you are coming later, send an email to lostinwonderart@aol.com, and I will give you a phone number to text when you get there to find our whereabouts. 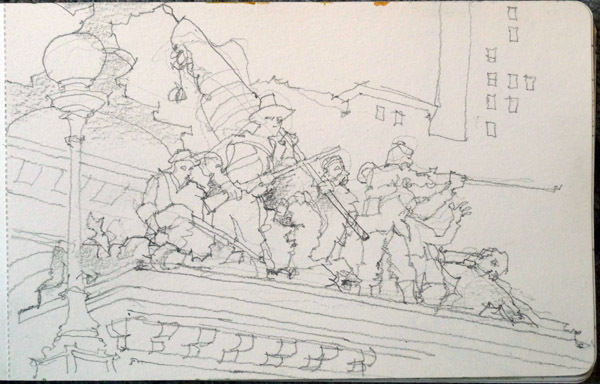 We'll look to draw for about 2-3 hours, depending on how interesting we find the location. The posted schedule for shooting puts them on Walnut Ave, which is only about a block or two away from our meeting spot. If by chance the schedule is off, we will be going over to East 9th. Watch here for weather-related updates. 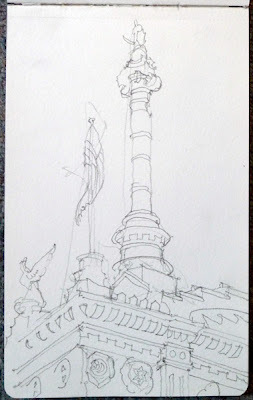 If you would like to be a contributor to the Cleveland Urban Sketchers blog, please also email lostinwonderart@aol.com. 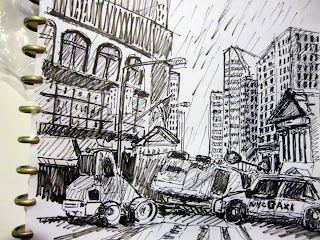 We would love to have a lot of drawings posted next week from the movie set. 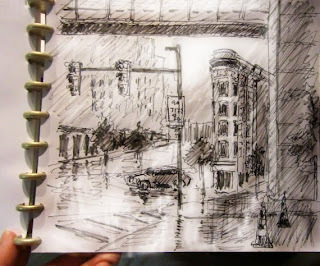 Here's two sketches from a sketch crawl a while back. They're in a watercolor moleskine which explains the texture of the paper. The upcoming Downtown Cleveland Alliance Sketchcrawl will be Saturday, August 6th at 10:00am. 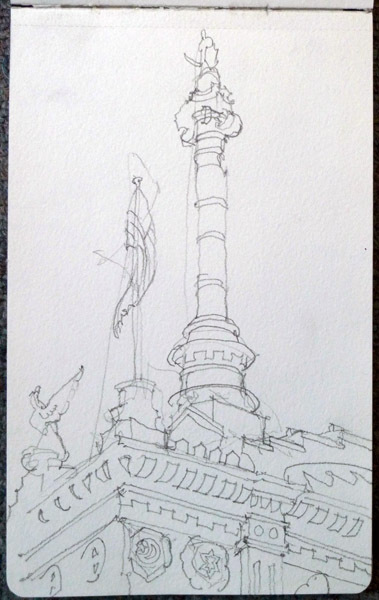 It will be a walking sketchcrawl during the Cleveland Take a Hike historical walking tours. Saturday meets at the Arcade (401 Euclid Ave). It will be a tour of the Gateway District. You can find more information here about this walking tour or the other tours that run weekly throughout the summer.